A lot was going on last year. No wonder we were feeling worn out after our last event in October. 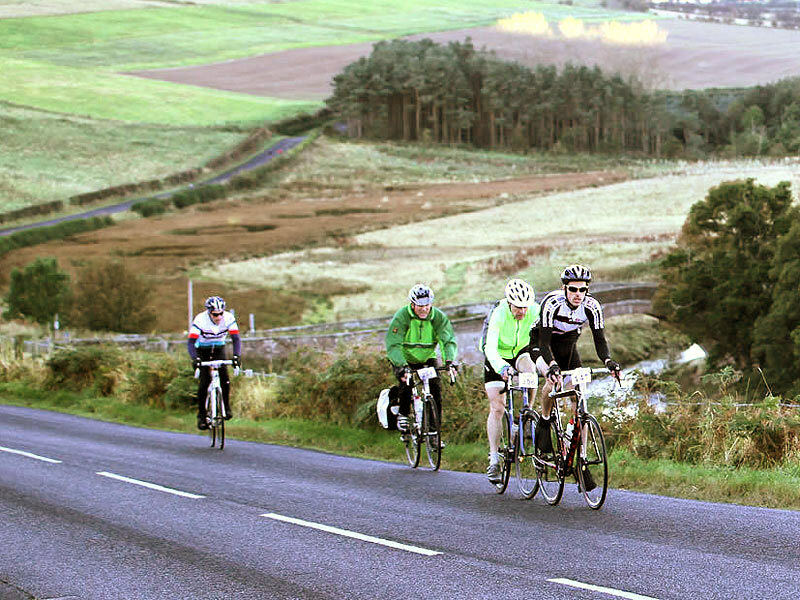 The three Wooler Wheel events in May, July and October attracted around 1200 entries and a great variation in weather. Lots of wind and a spate of showers for the Borderlands in May and for the Big ‘un in July; and the foggiest weather we could remember in Wooler in October. Then the Tour of Britain scorched its way through our territory and along some of our routes from Cornhill to Ford, Doddington and Wooler, and on to the finish in Blyth. Such a pity we couldn’t persuade the organisers to take the ToB route up Lyham Bank! Our new venture in the year, the Big ‘un, was hailed by its participants as one of the toughest and most uplifting rides they’d ever done – a complete 130 mile circumnavigation of the Cheviots and lots of steep climbs. It was a big logistical challenge for us, but aided by our partners, the Kielder Water and Forest Park, we overcame it. And when our shuttle rescue operation was called upon to recover two riders 70 miles from Wooler it worked smoothly. The greatest plaudits of the year must belong to those who completed the Wooler Wheel Triad – riding the longest routes in each of our three sportives, a total distance of 300 miles. Out of the 1200 riders who entered our events last year only 25 completed the Triad and so became members of the Wooler Wheel 300 Mile Club. You will recognise them in our Wooler Wheels in the coming year since they will, no doubt, be walking with a swagger and, weather permitting, wearing bright yellow jerseys with an emblem on the back that a Hell’s Angel would be proud of. The Big ‘un was a success in all ways, except one – participation. Only 75 cyclists entered and we needed 200 to break even financially. You might ask why. Too long, maybe? Too many other events going on at that time of the year? Whatever the reason, it is now curtains for the Big’un. But it was amazing while it lasted and we just had to give it a go. Sadly, we are not immune from the old adage “use it or lose it”. What we have not lost in 2016 though are the Wooler Wheel Borderlands on 14 May and the Wooler Wheel Classic on 1 October, both still going strong. We look forward to seeing lots of you taking part in these events.